Forget fitting your digital devices into your tight jeans pocket now that digital ease can be fit into your jeans. Google is working with Levi’s to develop jeans with a special conductive fabric to add digital access to denim. 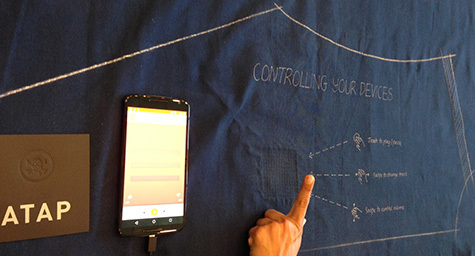 The fabric incorporates special sensors that would let wearers use their jeans as touchscreens. Fusion.net sized up the story to shows how digital has legs. This computerized-jeans concept was devised in Google’s top-secret research lab. It’s been so confidential that it was code named “Project Jacquard” in honor of power-loom inventor, Joseph Marie Jacquard. Google’s Project Jacquard team collaborated with one of Japan’s boutique textile manufacturers to develop the special conductive yarn that would power the denim. They originally tried to tightly weave the yarn into the fabric, but this approach wouldn’t allow them to connect the required electronic components to power and capture data from the yarn. After many trials, they designed a dual-layer system that let them embed electronics in the middle of the fabric. This made it easy to connect electronics to the actual conductive yarn without affecting the denim’s design. While jeans are the initial focus, the greater goal is to integrate conductive yarn into every fabric and garment in people’s lives to provide unlimited digital access. These computerized jeans would let wearers be connected to their digital lives while enjoying their daily lives. They would eliminate the disruption of always reaching for a smartphone or carrying a tablet to access digital data. The denim is still in development as Google and Levi’s are still determining the right application for the technology. But these jeans should pop up in stores in the near future to fit our digital lifestyles. “If there’s a chance to enable the clothes that we already love to help us facilitate access to the best and most necessary of this digital world while maintaining eye contact with the person we’re eating dinner with, this is a real value,” said Paul Dillinger of Levi Strauss. Discover what matters in digital marketing. Contact MDG Advertising today at 561-338-7797, or visit mdgadvertising.com.